I am working on a baby sweater knit from one cuff across to the other.... I am done with the sleeve and about to cast on for the front and back. I read your post on the backward e loop. I am wondering if you have any further techniques for this situation. The cast-on edge will be hidden in the seam. 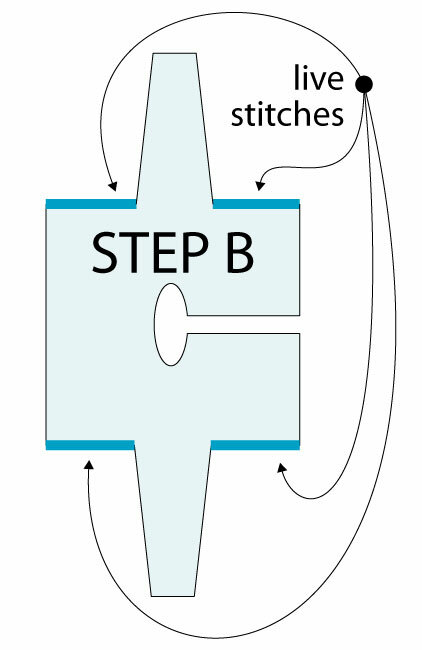 To create the foundation for the body stitches, you could use the backwards loop cast on, with the modification shown in THIS POST. However, the problem with this trick for a very long edge is the problem of all cast-on's, and that is tension. For such long edges (and so many of them!) you might want to consider a different approach. 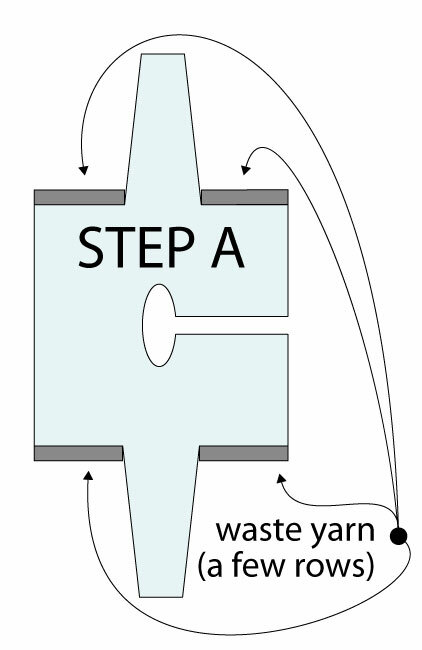 Cast on the extra number of stitches you need for the body in scrap (waste) yarn and knit a few rows--you will have two pieces of scrap fabric ending with live stitches--these are shown as gray rectangles on the illustration below. Once these waste yarn rectangles have been created, simply knit the stitches for the body along the new stitches you have created with the waste yarn--the waste yarn stitches take the place of the cast-on. (This is a refinement on a method known as COWYAK). When you get all the way across the body to where the other sleeve begins, cast off the body stitches and make the second sleeve, as directed by your pattern. At the end of the project, carefully remove the waste yarn and cast OFF the live stitches. 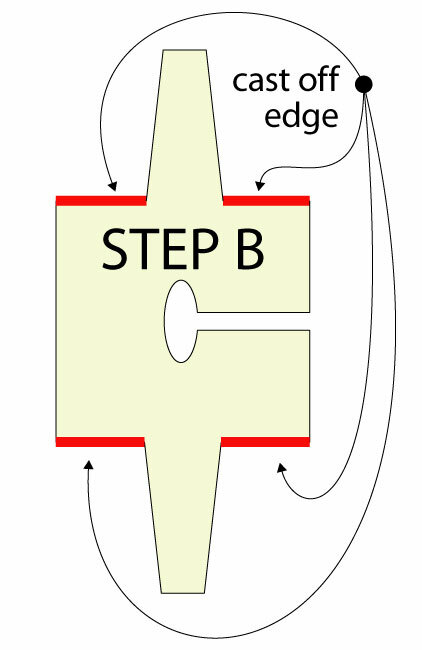 The four cast-off edges are shown in red on the illustration below. 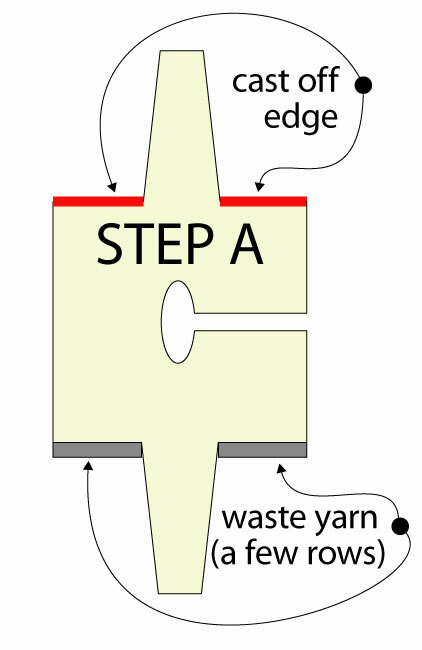 A cast off can be adjusted or even taken out and re-worked, meaning that you can adjust the tension of the stitches formerly on the waste yarn fabric when you get to the project end. 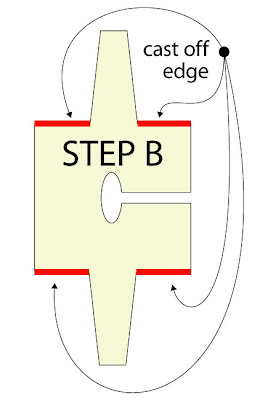 Another advantage of casting off the lower edge at the end, instead of casting on at the beginning, is that four long edges for the body match exactly for method of construction. Matching both the tension and the construction of all four edges means that the two long body seams are more likely to look and drape identically, since they have the same amount of yarn inside each seam, and are the same finished length. An variation on this approach is that when you get to the other side of the body, instead of casting OFF the long edges, you could knit those off with waste yarn also for a few rows before you start the sleeve. 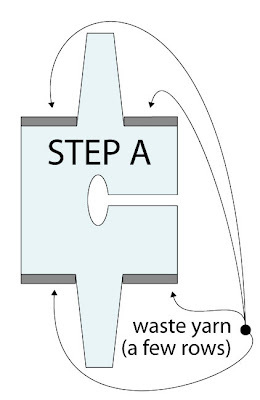 The result is that all four long body edges wind up on waste yarn fabric--the four waste yarn rectangles are shown in gray on the illustration below. If using this variation, then at the end of the project, you can remove the waste yarn from all four long edges, so that you once again have live stitches, as shown by the blue edges on the illustration below. Once you have live stitches on all four edges, you can simply 3-needle bind off the live stitches at each long body seam--a situation many knitters find easier than seaming-by-sewing. This is a quick method of length reassignment surgery. It lets you split off fabric very quickly and accurately, along an single row, and does not affect the live loops--the tugging to get the snipped yarn loose looks like it would distort the underlying fabric, but in all the years I have been doing this, the live loops are always in perfect shape once the tugging ends. You do lose the amount of yarn in one row, but this seems a small price to pay for not having to sit and squint at the fabric to unpick the snipped row.